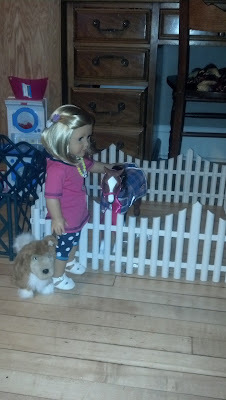 American Girl Doll Play: From Garden Fence to Horse Corral! From Garden Fence to Horse Corral! For quite some time I have been in love with the American Girl horse stable but I wasn't sure my girls would play with it enough to be worth $100, but when I saw this plastic garden edging I knew that it could have a new purpose. 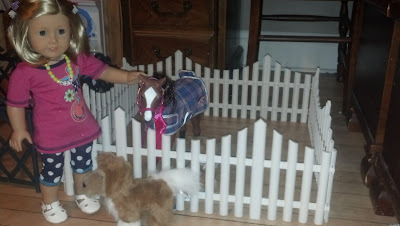 For just $1.25 a section, the 4 pieces easily snap together to for a very cute horse or pet corral! I did have to score and then snap off the 2 spikes that would have allowed the garden edging to be pressed into the ground. 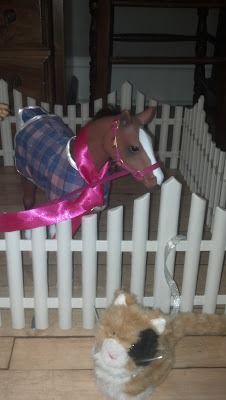 I was a little nervous the corral would be to flimsy but once I cut off the spikes and snapped it together, it was fine! 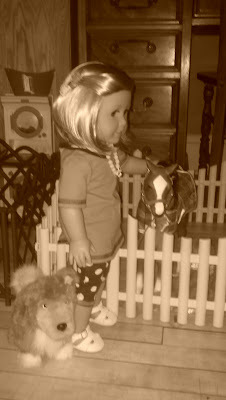 I need this for my daughters AG horse. Where did you get them? That is so cute!!! Can u tell me where u purchased the fencing pieces to make this? Thanks!!! Can you tell me where u purchased this fencing? Thanks!